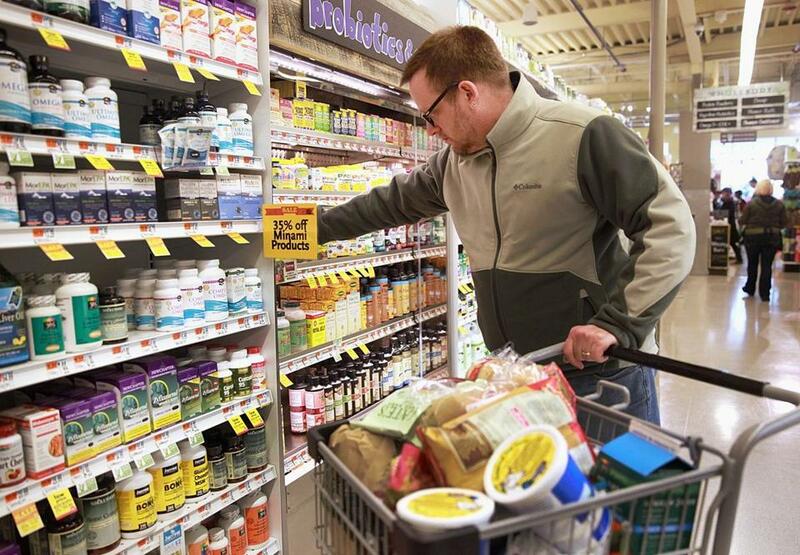 David Harris shops for the family at Whole Foods in Arlington. Friday nights were sacred in young Evan Weymouth’s family home in Maine. His father attended the high school football games, and Evan went to the grocery store with his mother. It’s a dusky Tuesday evening, and Weymouth, 29, has just finished a quick spin through a Market Basket in Seabrook, N.H., with his 3-year-old daughter. As he loads the half-full plastic bags in the car, Adelynn dances around the shopping cart, the lights in the soles of her pink sneakers flashing. But Weymouth, who restores classic cars for Paul Russell and Co. in Essex, represents a growing percentage of men who are more than willing to shop and prepare meals for their families. According to a recent report from Midan Marketing, a Chicago marketing company, nearly half of 900 men surveyed said they do at least half of their family’s grocery shopping. Of that group, more than half said they do all of it. Most grocery industry experts agree that women still do most of the shopping. While the numbers vary somewhat, the Midan survey is just the latest in a series of reports in recent years that have found that men are taking a greater role in buying groceries. For a long list of reasons, including the growing ranks of stay-at-home dads, the weak economy, the increasing tendency for shared responsibilities in couplehood, and men’s burgeoning interest in cooking, supermarket aisles are filling up with men. And the industry is looking at their buying habits and how to keep them coming back. That explains some of the drift toward more stay-at-home fathers, who naturally assume many of the chores and errands their mothers might have handled. Amid the nation’s economic woes, many men also lost their jobs and found themselves among the ranks of the unemployed or underemployed. But there are plenty of men in double-income households, who earn as much or more than their wives, who volunteer to do at least some of the grocery shopping simply because they enjoy it. During the week, he said, he gets periodic texts from his wife and kids with suggestions to add to the grocery list. Doing the shopping himself, he also gets to make plenty of choices of his own. That seems to be a recurring theme among men who shop. According to a recent Consumer Reports study, more women said their husbands are prone to making impulse buys when they shop (44 percent) than men said of their wives (33 percent). “Women are less likely to be fascinated by something new,” explains Underhill. Historically, he says, women tend to shop with the family in mind more than men, who tend to follow their own urges. Conversely, while men seem more susceptible to spur-of-the-moment purchases, Underhill says men are more likely to arrive at a store with a plan and stick with it. Men often decline to take a shopping cart, for instance, preferring to grab the half-dozen items they came in for. Retailers and manufacturers have taken notice of the trend and are looking for ways to appeal to men. Some stores have tried “man aisles,’’ stocked with items such as barbecue goods, hot sauces, beer, soda, and chips. Food companies have taken a second look at packaging and planned giveaways of products at man-centric events such as NASCAR races to build brand loyalty. A spokesperson for Shaw’s said the grocery chain is currently developing policies to better serve male customers. The Midan study suggests, though, that while there are differences between the way men and women shop, they are not drastic. But men, many of whom are neither accustomed to nor completely comfortable with the task, appear clearly receptive to guidance. “The big focus for us is on convenient shopping,” said Katie Lamie, marketing team leader of Whole Foods’ Arlington store. “We sell a lot of prepared meals and grab-and-go dinners.” Employees are trained in upscale customer service, she said. If a male shopper asks for help finding the ginger, a clerk might ask whether he would like some advice on how to slice it. “It’s not so much a taboo anymore for a guy to cook,” said Katerina Thompson, who manages the Crosby’s Markets in Salem and Manchester-by-the-Sea. Given the expansion of grocery sections at pharmacies and discounters such as Target and Walmart, as well as the resurgence of an artisan culture that is spawning new specialty stores for bread, cheese, meat, and more, industry observers are seeing a lot more “cherry-picking,” he says. If it happens, that could be one thing men and women would agree upon. James Sullivan can be reached at jamesgsullivan@gmail.com.